Detached house that has complete privacy because of the location. 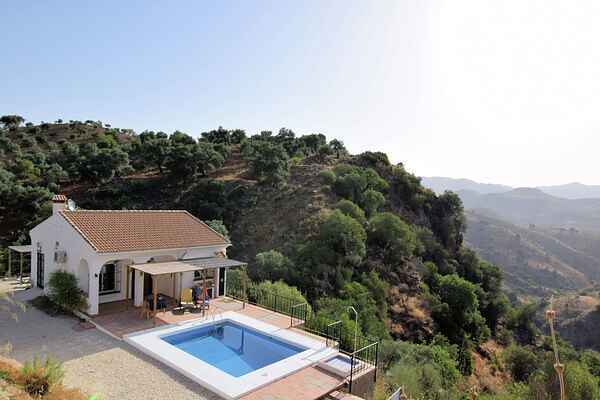 It is located in a valley offering panoramic views of the Andalusian land. Here you can enjoy a well deserved rest. In front of the house is a large terrace with private pool and outdoor shower. The terrace is partly covered and equipped with a dining area and from here you have a beautiful view of the surroundings. This environment lends itself well to making beautiful walks. The old path of the Camino de Santiago even passes by the house. The charming white village of Almogía is a few minutes in the car and has all the facilities such as supermarkets, cozy restaurants, banks and pharmacies. A visit to Malaga (25 km) is highly recommended. You will find culture (Picasso Museum, Pompidou Center, the Alcazaba and the cathedral) and Malaga offers nice tapas bars in squares and in the small winding streets. For a day at the beach Torremolinos is the nearest. Here are especially wide sandy beaches with many beach bars where you can enjoy delicious seafood.